As Lord Mayor I recognise the central role of TAFE in the building of the social, cultural and economic capacity of communities, not least the Illawarra. Education is the gateway to providing opportunities to the youth to enable them to reach their full potential and others to reengage n the workforce. We all must support our region and the industries which provide employment and the educational institutions, such as TAFE, which support our communities economic and social sustainability. I would like to congratulate all those involved in the TAFE Community Alliance. 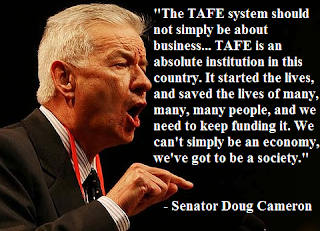 TAFE within the community is vital to help address the skills shortage. The highly professional and trained staff need to be provided with adequate funding and resources to ensure the longevity here in NSW. I support the Alliance and their campaign to maintain TAFE's vital role in vocational education and training. It is critical that TAFE continue to offer quality vocational education and training that is affordable and accessible to all sections of the community. Further increasing fees will effectively prohibit many prospective students from accessing TAFE courses, which will be reflected in a diminished skilled workforce and the loss of opportunity for individuals to progress to higher-level qualifications. The resultant effect on the community and employers is potentially devastating.